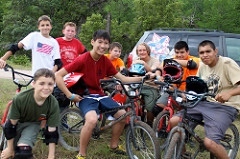 On this ruggedly beautiful reservation in the Texas Hill Country, youth, families, and adultvolunteers of all ages enjoy weekends, day excursions, and week long summer camp experience. Bear Creek is located 20 miles west of Kerrville, Texas, which lies on Interstate 10. Take Highway 27 west of Kerrville six miles to Ingram. In Ingram, take Highway 39 six miles to Hunt. In Hunt, turn onto FM 1340 and go six miles to Bear Creek. Camp use is by Reservation only, and reservations must be made through the Council Service Center’s website at www.AlamoAreaBSA.org/Rentals a minimum of one (1) week prior to use. Camp is closed for all use on all Holidays observed by the Alamo Area Council. The gate code for your event must be disseminated to your personnel. Gate will remain closed at all times. Use gate code for ingress and egress. Unless prior arrangements are made, all campers and visitors must check in at the Check-in Cottage immediately upon arrival. In the event that you cancel your trip, please call and inform the Camp Director or if you know early enough notify the Council Service Center. Check-In for weekend camping will begin no earlier then 2:00 pm on check-in day and Checkout is no later then 2:00 pm on checkout day. Before leaving units must have their facilities inspected and Checkout with Camp Director. Report any problems and/or emergencies to Camp Director as soon as possible. Campers must remain on the property unless accompanied by two leaders. Leader must inform the Camp Director if anyone must leave the property. All payments, deposits, and environmental fees are collected at time of reservation. Prices are non negotiable. Deposits will be collect on the Canoes, Staff Quarters, Dining Hall (No-Kitchen), Conference Center and rooms. Deposits are refundable only if all rented facilities are cleaned up according to the cleaning/checkout list posted in all buildings and unit/group checks out at the appropriate time. If unit/group does not clean according to cleaning/checkout list or goes over checkout time they will be charged additional fees. Cleaning fee will be $50 per hour with a minimum charge of $50. The environmental impact fee is placed on campsites as well as other outdoor facilities. This fee directly supports the maintenance of the camp and the Leave no Trace policy. Bear Creek Scout Reservation rentals cancelled at least 3 days prior to the arrival of the reservation are transferable; otherwise you will receive a refund by check minus a 20% cancellation fee. If the reservation/rental is cancelled within 3 days, no refund is given. Transferable reservations/rentals are only valid within the same calendar year of cancellation of original date. Example: if original reservation was planned for June and cancelled prior to 3 days before original reservation date, transferred reservation must be used by December 31 of that year. Posted speed limits on camp are 10 miles per hour on blacktop roads, and 5 miles per hour on gravel/dirt roads. Camp is for hiking; vehicles should be parked for the duration of your stay. Trailers may be left at campsite locked to the tow vehicle. All pop-up trailers and RV’s must be in designated parking spots. PASSENGERS ARE NOT TO BE TRANSPORTED IN THE BACK OF ANY TRUCK OR TRAILER, OR IN A SUBURBAN, STATION WAGON, OR VAN WITH THE DOORS OPEN!! All Campers should be in their own campsites and quiet between the hours of 10:00p.m. and 7:00a.m. Lights out is at 11:00p.m. Your unit is responsible for cleaning any facilities that you use and you will not be permitted to leave until the Camp Director is satisfied with the cleanliness of the facilities. Do not disturb any wild or domestic animals or plants. Leave your area cleaner that you found it. Removing archeological artifacts from the property is illegal. Please turn them in so that they can be displayed and seen by other scouts. Depending on drought conditions, fires will be permitted at the Camp Directors discretion, in existing fire rings. Fires should not exceed heights greater than the edge of supplied fire ring. Liquid fueled camping appliances are also prohibited. Fires must be attended at all times. Do not burn or bury any trash. All trash is to be disposed of in dumpsters or carried out when you leave. Immediately report any acts of vandalism to the Camp Director. Additionally, if there are any problems with or damage to any camp facilities please notify a Camp Director. DO NOT PUT NAILS OR SCREWS IN ANY STRUCTURE ON THIS CAMP!! YOU ARE RESPONSIBLE FOR REIMBURSEMENT FOR ANY DAMAGES ATTRIBUTED TO YOUR UNIT!! The following items are prohibited from being brought to camp; Liquid fueled camping appliances, fireworks, personally owned firearms (including air rifles), archery equipment, slingshots, or any other equipment that propels objects, alcoholic beverages, motor driven equipment (ATVs, generators, chainsaws, etc) bikes, pets, illegal drugs; fixed blade hunting knives; machetes and aerosol spray cans. The Alamo Area Council provides health/accident insurance for registered adults and youth. Report all accidents and emergencies to the Camp Director. *All other rules and policies of the B.S.A as found in the Guide to Safe Scouting must be followed while at camp. This includes filing a tour permit with Council office, having two-deep leadership with YPT, and at least one adult BALOO-certified for overnight Pack camping.